A beautiful tree mural with very little painting required. You can create a tree mural design using the concept from my previous post. Find yourself a tree shape outline. There are loads to be found when you ‘search on ‘tree mural’ and using the google images option. Find a tree shape that you like and copy and trace the image onto your wall freehand, or onto overhead projector film and project the image onto the wall and trace. Alternatively you can buy the tree mural design below from me from my websites. The shape will come as a full sized paper pattern and transfer paper which you tape to the wall and trace the design onto the wall. This will make your life much easier. Next draw up a simple leaf shape that you can use as a template. Draw it onto cardboard and cut it out. This is your template. Go to your local DIY decor store and choose a wallpaper design. You could choose 2 or 3 designs that coordinate well. Save money by looking in the bargain bins or ask for samples of each paper. Choose designs that have small repeat patterns. You could also use beautiful craft papers. There are so many gorgeous design to choose from. Take your leaf template and draw as many leaves as you can on the wallpaper or craft paper as you can fit. Cut each leaf out. The tree above will take about 100 leaves. Paint in your tree trunk with a tree colour of your choice. It could be any colour, not just brown. If you want a subtle look, paint it in a pale greeny brown or any pale colour of your choice that will tie in with your leaf wallpaper colours that you choose. Use acrylic craft paints or tester pots of arcylic wall paints from your local DIY store. When your paint is dry, paste your wallpaper leaves onto the ends of your branches using either wallpaper paste or PVA glue which dries clear. Overlap some of the leaves. You could have some blowing in the wind, or in a pile on the ground for an addtional effect. Cut out some little bird shapes and paste them in the tree too. There you have it! A simple and effective way of creating a tree mural for your baby nursery or child’s bedroom. I came across this delightful idea for a child’s room or nursery from Enfant Terrible. It even has a little bird house with a light inside it! 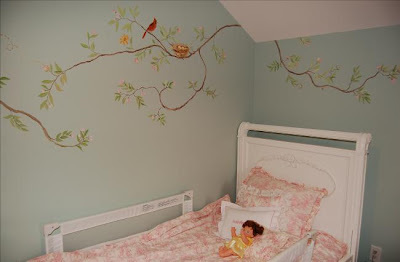 Silhouettes of little birds are also available that you can paste around the room as in this tasteful baby nursery. A baby will not grow out of this design too quickly as in some mural themes. In fact I would be happy with this mural in my room! This is a really easy tree mural for you to create as you simply paste it on your wall. The leaves are handcut from designer and vintage wallpaper by Inke, and are available in spring, summer and autumn colours. They are made by hand in Leiden, the Netherlands, providing meaningful employment to adults with disabilities. Priced at C $323.00 for 5 piece trunk and 84 leaves. The trunk may be trimmed. It’s packed in a tube complete with a brush, a packet of paste and simple instructions. It’s not often people think of grey as a bright and fun color suitable for children’s decor or the nursery art for your baby. Grey is however often a very elegant color which allows more vibrant parts of the kids room to jump out, while avoiding the clutter that can come to be associated with bright rooms. A sophisticated color grey is a key component to many color schemes, especially in a children’s rooms where strong and bright schemes are often used. For grey after all does not have to be made from mixing black and white, grey can be made from mixing complimentary colors such as red and green, blue and orange, or yellow and purple. Such mixtures if done correctly can be vibrant and very warm bright colors in their own right. Such colors include butter milk, silver, white gold, platinum, and creamy colored diamonds. With these colors in mind it’s easy to begin to see how grey can be a fun color used to ad vibrancy to your child’s nursery or room. Of equal importance these complimentary greys can be used to bridge the gap between the complimentery color schemes of a room. This will help prevent the complimentary color scheme from hurting your child’s eyes or becoming generally overwhelming. Avoiding the overwhelming nature of bright color schemes is especially important when you are designing a room for your child. As children’s décor is often made better with simplicity and only a few bold statements. Even as grey can turn what might have been an overwhelming color scheme into a fun possibility it can add its own emotions to any color scheme. In the example of purple and gold, a silver like grey could help to make the room seem regal dignified which could be very fun for a child. A butter milk grey could also be used in a similar way to as a bridge between the complementary colors of pink and aqua green to help create the perfect room for a princess without the overwhelming sensation that pink can cause. Even as Grey can be the perfect color for a child’s room it can also be a good color for the children’s wall art, or the art you might hang in your baby’s room. This is because as a subtle color grays can be used to create great detail or pictures which can stir the imagination. The color grey is easy to look at which means that any pictures done in this color will be easy on the eyes allowing a child to stare at them for a long period of time. There is one last advantage to grey rooms and color schemes, this is that because grey is so easy on the eyes it creates so few distractions, and requires so little mental effort to process. This means that it is easy to spend long periods of time playing in a light grey room, and grey is believed to help stimulate thought and creativity. Ty Hulse is a children’s artist and psychologists who runs the web site http://www.kayart.net where you can browse new and interesting art for children, nursery decor or get custom works designed for your child’s room. Boy was it hard picking a winner for this Children’s Mural Contest. Everyone had such great ideas!! Thanks to Dawn of Nursery Murals and More for hosting my custom children’s mural competition. She has been a delight to work with, and I hope to do more joint ventures with her in the future. We decided we liked the robot idea the best. So Congratulations Miranda Dixon aka JustMyRinda or you may know her by her Twitter name: @fabrichound. I will be working with Miranda designing a paint by number mural for her children in a Robot theme and then incorporating this new theme into our Children’s mural selection at Wallstory Murals. Thank you everyone for being a part of this fun giveaway. We will be offering more fun things in the future, so stay tuned! Thanks to Debra Conrad for this technique. My favorite way to paint the water portion of an Underwater Mural is also the best way to paint a sky background. If you can master this technique… Ocean Style Murals and Cloudy Sky Style Murals will be quick and easy to accomplish. Step 1 : Paint the entire wall blue. Step 2: Glaze the entire wall with blue. In a nutshell, that’s it! So… now I will give you the essential tricks of the trade to achieve these results. The entire wall must be painted in the baby or powder blue color. This base coat color must not be skipped. This technique looks terrible over a white background. The chip brush is used for two reasons. You just can’t get close to the ceiling or baseboards with a Woolie Pad so I use a chip brush to cut into these areas… blending very carefully. I need a tool to get the blue glaze applied to the Woolie because if you just dip the pad into the glaze, it will soak up to much liquid. The Woolie Pad is used because the technique requires long horizontal strokes that can’t be accomplished with just a brush. Also, the Woolie Pad makes painting sky or water murals easier on textured walls. The ratio of glazing liquid to blue tint is not an exact science. The formula for the glaze is – 6 parts glaze to 1 part blue tint. The paint is “glided” on in horizontal (left to right) strokes. More glaze (intensity) is applied as you work your way down the wall. I keep a dish of clear glaze and a spray bottle of water nearby. I can work the horizontal striations (what looks like brush strokes) out of the painting as I go. Remember to work with a damp Woolie Pad. Always spritz the pad with water and work it into the wool before you start painting. And… keep that pad damp. If you have to walk away from the work area, slip the pad into a plastic bag. The tips of the wool pad can dry and then all the softy goodness is gone. I met dawn on Twitter, and she has inspired me enormously with her energy and beautiful mural designs and ideas. She agreed to be interviewed about her life as a ‘work at home mom’. Give a brief description of your business and what motivates you. 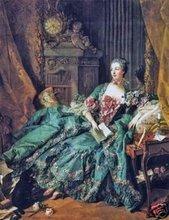 I run a New York based decorative painting company called Surfaces with Paint. We specialize in faux paint and plaster finishes, custom stenciling, hand painted wall murals, children’s rooms, and much more… I am motivated by making people smile after they see the job completed. I am motivated by working hard to get better with every job that I do. Where do you get your inspiration for your murals? My clients share with me their ideas and I take it from there. Believe it or not, my favorite place to find inspiration is Google. I also enjoy getting inspiration from nature and the things around me. What is your favorite theme for children’s murals? Which two murals are you most proud of? I don’t know if you would call this a tool, but I can’t do a mural without matte medium to thin out my acrylics and make them more moveable. I sometime use sponges, but I mostly use brushes. Do you use a particular make of paint for your murals and do you have any advice about paint for murals? I have no specific paint brand that I use. I use anything from acrylic artist paints, to acrylic craft paints, to latex house paint for large areas. As far as paint advice, I would suggest using some kind of medium to mix in with the paint to make it moveable. Sometimes water just doesn’t cut it. 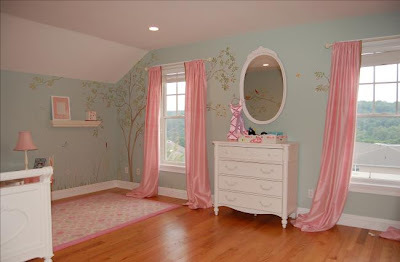 Have you painted murals for your own children and/or in your home? I have not painted wall murals for my own children. We are renting right now and are not able to paint the walls. We are saving for our own place and I look forward to creating murals for them in the future. For now, I am stuck painting on canvas in my current home. Do you employ staff or do you do all the work yourself? I mainly work for myself, but my husband joins me on occasion. I am in the process of training my hubby to do the faux finishes so I can stick with painting murals. How many hours a week do you spend on your blog and how much time do you spend actually painting? It depends. I just had my 3rd child so I have been taking some time off. When I am painting, I don’t have much time to blog, but I at least commit to posting once or twice a week. You have three small children one of which is only weeks old. How do you manage your childcare? My husband works the night shift, so he gets home early afternoon and I can then go to work. I also have a local stay at home mom who can babysit if I get a large job that requires me to work all day. What do you like to do to relax and get away from the internet/blogging and murals? I enjoy watching movies, reading fun catalogs, going on driving adventures, walking around our neighborhood when the weather is nice, and chatting on the phone with friends. What advice would you give to someone embarking on painting a children’s mural but have never painted a mural before? Research & Practice. There are lots of great online resources available. Do you feel that encouraging people to paint their own murals for their children’ will do you out of business? Not at all. I am all for helping people be creative. I charge for consultations though, so I can still make some money if need be. How do you manage your time between kids, housework and your business? What has been your most successful marketing strategies? My website is a huge help for my business. Most of my work comes from someone finding me over the internet. I market my business online by submitting to all the painting & art directories that I can. I get involved in groups. I write articles and post for my painting related blogs. http://www.muralsandfaux.blogspot.com & http://www.surfaceswithpaint.blogspot.com I also keep my website fresh and updated. There are so many different things that you can do to help you gain exposure. It is difficult to get things done with 3 small children competing for your attention. I also run an online virtual assistant business . I have few regular clients that need a couple hours from me each day. I use an online time clock program that is wonderful. I can sit down at my computer, turn it on one minute and then shut it off the next minute if the kids need me. This helps me keep track of my time without going crazy. And finally, do you have any advice for parents considering starting their own business? Go for it! Anything is possible if you put your mind to it. My work schedule is extremely flexible and I wouldn’t trade it for anything. I am done with the 9 to 5 jobs. It is so rewarding being your own boss and being able to be there for your children, especially when they are young and still at home. Depending on what kind of work you want to do, be sure to research the idea first before jumping in too fast. My husband recently started a moving company. He had all of the best intentions, but the one thing he neglected to do was research it first. He bought the truck. He got the supplies. But once it came to getting insurance, permits, etc. We found out that it was not possible because he needed a certain amount of commercial moving & driving experience. The business went down in only a few short months. So, make sure you find out what the business entails FIRST, such as budget, taxes, insurance, and permits. Pay Dawn a visit to her blogs and website. I think you’ll find them as inspirational and interesting as I do. She recently hosted my givaway custom mural competition on her Nursery Murals and More blog. Keep an eye on my posts as after we announce the winner I will be blogging the custom mural process and my design work for the winner. You’ve stumbled on FlutterBrush, the work of artist Kris Aro McLeod. Kris is a children’s writer and illustrator. She is a teacher and a mom. Her first picture book is out! It’s called HUSH-A-BYE COUNTING. It’s about dreams and love and beauty and just getting to sleep. It has pop-ups, lift the flaps, and lots of fun-filled rhyme! Check it out on Amazon. She makes her prints with attention to detail. The inks and papers are archival- made to last at least 75 years using an Epson 2400 printer, Epson Ultra chrome K3 inks, and Epson Ultra Premium Matte Paper. She won’t don’t sign, date, or send a print into the world unless it feels perfect!